Have you lost the art of reading for pleasure? Are there books you know you should read but haven't because they seem too daunting? In The Well-Educated Mind, Susan Wise Bauer provides a welcome and encouraging antidote to the distractions of our age, electronic and otherwise. Newly expanded and updated to include standout works from the twenty-first century as well as essential readings in science (from the earliest works of Hippocrates to the discovery of the asteroid that killed the dinosaurs), The Well-Educated Mind offers brief, entertaining histories of six literary genres -- fiction, autobiography, history, drama, poetry, and science -- accompanied by detailed instructions on how to read each type. The annotated lists at the end of each chapter -- ranging from Cervantes to Cormac McCarthy, Herodotus to Laurel Thatcher Ulrich, Aristotle to Stephen Hawking -- preview recommended reading and encourage readers to make vital connections between ancient traditions and contemporary writing. 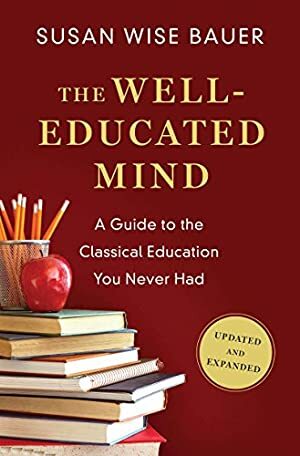 The Well-Educated Mind reassures those readers who worry that they read too slowly or with below-average comprehension. If you can understand a daily newspaper, there's no reason you can't read and enjoy Shakespeare's sonnets or Jane Eyre. But no one should attempt to read the "Great Books" without a guide and a plan. Bauer will show you how to allocate time to reading on a regular basis; how to master difficult arguments; how to make personal and literary judgments about what you read; how to appreciate the resonant links among texts within a genre -- what does Anna Karenina owe to Madame Bovary? -- and also between genres. Track It. This book may eventually drop below $9.99. Log In to track Susan Wise Bauer on eReaderIQ. to be notified each time the price drops on any book by Susan Wise Bauer. to stop tracking Susan Wise Bauer. We started tracking this book on September 24, 2015. This book was $16.35 when we started tracking it. The price of this book has changed 95 times in the past 1,309 days. The current price of this book is $19.85 last checked 5 hours ago. This lowest price this book has been offered at in the past 90 days is $19.25. This lowest price this book has been offered at in the past year is $14.00. The lowest price to date was $14.00 last reached on December 5, 2018. This book has been $14.00 one time since we started tracking it. The highest price to date was $23.49 last reached on June 25, 2018. This book has been $23.49 2 times since we started tracking it. We last verified the price of this book about 5 hours ago. At that time, the price was $19.85. This price is subject to change. The price displayed on the Amazon.com website at the time of purchase is the price you will pay for this book. Please confirm the price before making any purchases.